K29A/B Triple Point of Water Cell — Pond Engineering Laboratories, Inc. The Triple Point of Water (TPW), the temperature of pure water, ice and water vapor in thermal equilibrium, is the reference temperature for resistance ratios in platinum resistance thermometry. Its assigned value on both the Kelvin Thermodynamic Temperature Scale and the ITS-90 is 273.16 K (.01 C t90). The easiest to use and most cost-effective of all the defining fixed points, the TPW provides the ultimate in accuracy for calibration of precision thermometers of many types. 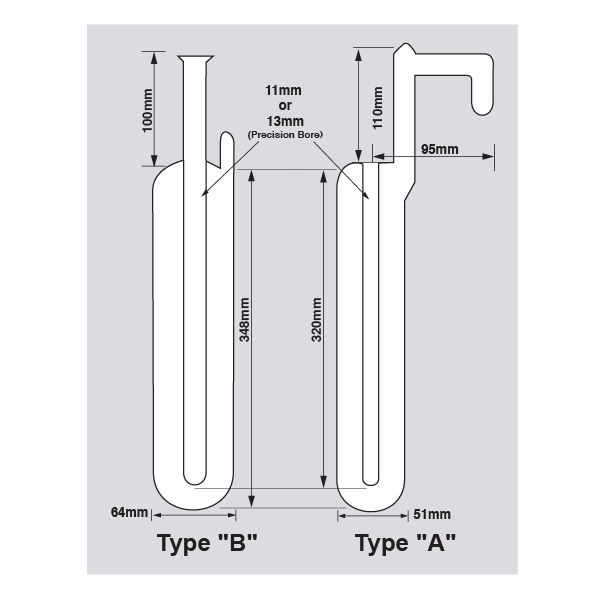 Pond Engineering constructs TPW Cells of high-quality borosilicate glass (also available in quartz) using precision bore glass tubing (standard 11 or 13mm inside diameter, other sizes available on special order) as the thermometer well. Following thorough cleaning of the cell interior, the cell is filled with ultra-pure degassed water, evacuated and flame sealed. Pond Engineering manufactures both Type A and B styles. 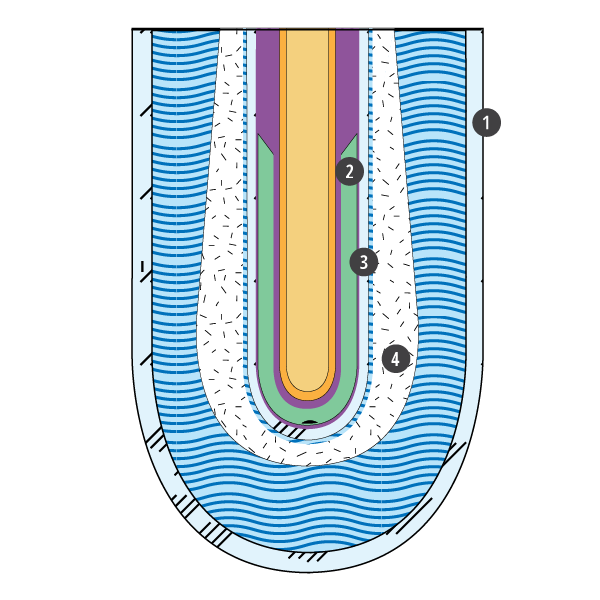 The portion of the glassware extending above the top of type A cells (the "handle") indicates the cell's partial air pressure. Significantly larger in diameter, type B cells allow users to form a thicker mantle and can be better guarded from heat transfer from above the cell, extending mantle lifetimes. The small glass protrusion at the top of the cell body also serves as a low resolution indicator of the partial pressure of air in the cell. Uncertainty, reproducibility and stability of the temperature realized in a TPW Cell are nothing short of phenomenal. Pond Engineering TPW Cells are guaranteed to realize a temperature within +0.000 0, -0.000 2 K of the theoretical ideal TPW. Furthermore, this high standard of accuracy is guaranteed for five whole years. Low-cost maintenance systems make TPW cells more efficient than conventional ice baths, even for routine calibration work. A properly formed mantle, consisting of two liquid-to-solid interfaces, is easily and quickly realized using the K29iX Direct Expansion Cooler (not included). With a proper mantle, accuracy is guaranteed for five years to be within +0.0000°C/-0.0002°C of the ideal fixed point. When used with Pond Engineering's Model K29D Water Triple Point Cell Maintenance System, the mantle can be maintained virtually indefinitely with minimal operator time. Available in both Type A and B styles.